The 2004 Eddie's Patch bears a strong resemblance to the inaugural 2000 bottling and at this early stage it has the potential to be among the most complete releases to date. Strongly representative in terms of fruit character and structure of the generally moderate 2004 growing season, the wine shows greater cool climate aromatic elements than earlier vintages plus a heightened natural seamlessness and symmetry. In contrast to the massively extracted 2002 and broodingly dense 2003 wines, in 2004 we still see the great density and richness of fruit extract that the vineyard offers, but these elements are woven together in a more vibrant and elegant frame, providing an increased level of polish and harmonious balance to the wine. The earliest bud break and subsequent harvest to date, the remarkable consistency of the site was once again apparent in terms of canopy growth, cluster number and morphology and berry size. For the fourth consecutive year we produced sixteen barrels of wine (2005 makes five years) from the 2.5 acre organically farmed, terraced hillside block. The highly friable red volcanic soils provide excellent drainage and tend to dry out by veraison allowing us to apply moderate stress, which keeps berry size small and eliminates the need for extensive crop thinning. 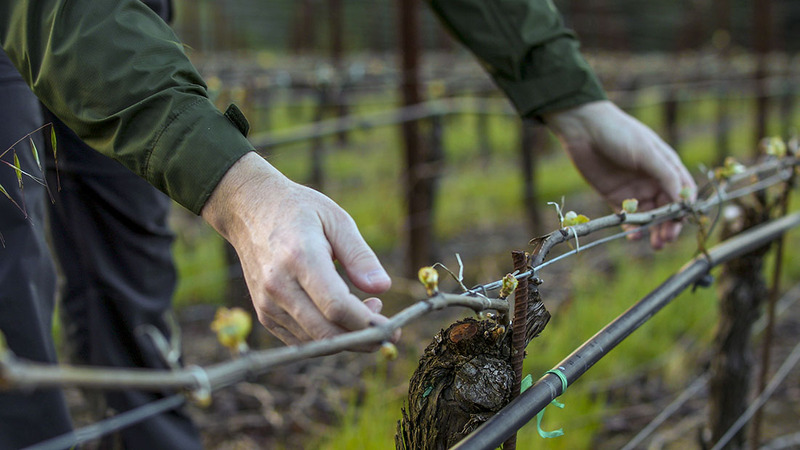 By strict winter pruning, we direct maximum vine energy to the clusters and harvest at lower sugar levels with good natural acid and rich powerful skin tannins. Purple/black color. Highly complex nose combines fruit aromatics of dark cassis and blackberry with site-driven aromas of earth, lavender and minerals. These notes continue on the palate where a strong sense of cool climate floral, graphite minerality is immediately apparent. The broodingly backward mid-palate that is typical of the vineyard features a core of deep, dark fruit and leads to a dense chewy finish featuring muscular, mouth-coating tannins. Certainly a wine with 8 to 10 years positive aging potential, I recommend cellaring the wine at minimum for a year after release.